Musical Humor! 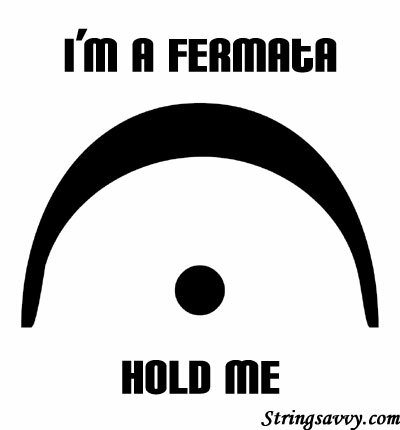 Great Musical/Pun/Spelling Images! 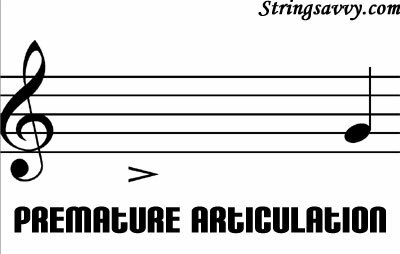 | Free Violin Lessons at Stringsavvy.com! Musical Humor! 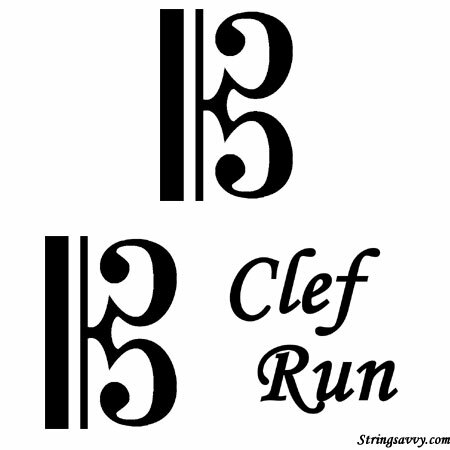 Great Musical/Pun/Spelling Images! I came across a series of music joke images over time- I was unable to find the originals so I remade the ones I could remember, as well as made up a few of my own. If you enjoy puns or play on words/music, you’ll get a kick out of these! I’ll post more as I find them! 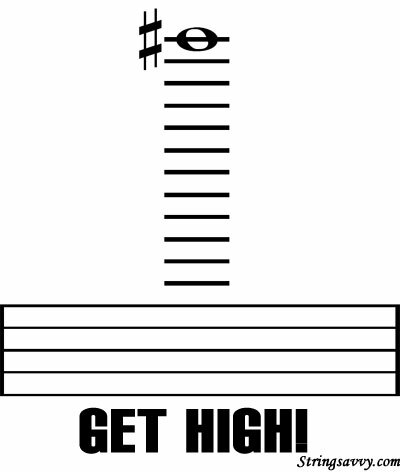 “Get High” with a note high up in the ledger lines! Who says us music nerds don’t have a sense of humor? I’ve been having a hard time find these -Do you have one not listed here? Post it in a comment below!! Thanks to commenters below: here are some new ones as of 7/5/08! “Shut your F A C E ” spelled out on the staff with letters. Visit the Lesson page for Free Violin Lessons. just praise from me — I love these! Nerd humour not about computers for once, brilliant! My favorite is ‘shut yer F A C E’, spelled with the letters on the staff. Nerd culture need not be extended toward musicians through the means of cheap “inside jokes” with poor musical puns. 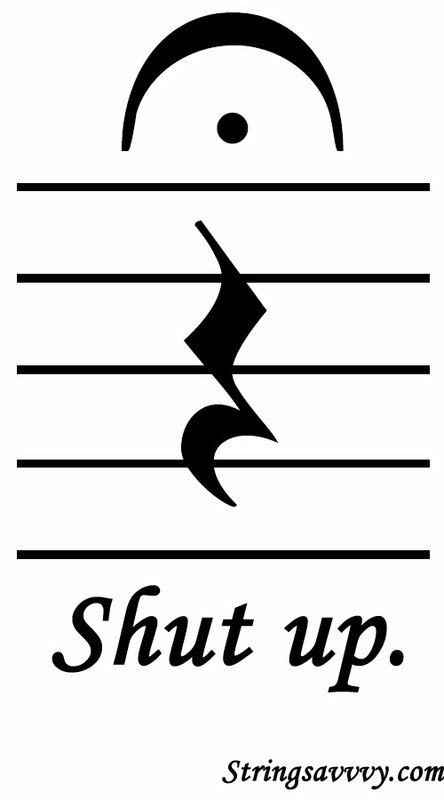 Two D notes above the staff. Awh, why the viola hate? Hahaha, these were good, but I didn’t quite understand the last one, only ever having played Piano which generally only deals with trebble and bass clefs. Heh, at first I thought it said “You’re a DCDG”. I would buy that last one if you had that in a t-shirt? New shirts are coming soon! Such a marvelous twist on the old pundit of making music into a language all of its own! Thank you so much for this opportunity to once again be reminded of just how uniquely humourous we geeky musicians, composers, and arrangers can be! While I, too, have seen others similar to these in the past, yours are absolutely refreshing, mainly because you had the forte to publish them! LOVE it!!!!! I love the “hold me”! you pretty much rock! of course the usual flute player would love the ‘get high’ one. the best music pun ever: Show me a piano thrown into an army trench, and I’ll show you A-flat major. and then theres the A-flat minor (‘miner’) one where you throw a piano into a mine. and one of my other faves: when carrying your instrument, you better C sharp or you’ll B flat! got plenty more where they came from. OMG i had to send this link to everyone in my schools music department. The “get high” one was a HUGE hit. my school’s choir just got shirts that say “Without Concert Choir The World Would B flat” with the key signature for B flat.